Prefer Pets Backpack Pet Carrier Privacy Covers | On Sale Free Pads! FREE pair (2) of Breathable Pads with the purchase of your PreferPets pet carrier. Help protect your carrier for years of traveling with your cat or dog. The PreferPets Backpack Carrier with Privacy Covers allows you to take your smaller pets with you wherever you go. Being soft-sided it is able to be used on a vast majority of airlines. The carrier can be converted to be used as a backpack, shoulder bag, or just a handbag using the two removable straps and top carrying handle. Ventilation is abundant with three sides of the carrier having a thick plastic mesh. Note that the carrier can compress which will reduce the height measurement to fit under the seat if flying. For your pet's comfort and safety and to meet commercial airline regulations if flying, your pet should be able to stand up and turn around in its carrier. Measure your pet carefully before ordering using the chart below. Be sure to order the correct size pet carrier. 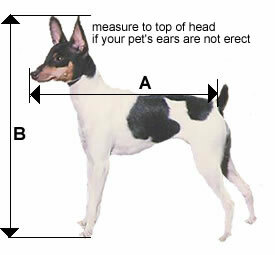 Measure your pet from the tip of the nose to the base of the tail and from the top of the head to the ground. Airlines require that dogs and cats must be able to stand up and turn around in the pet carrier. If you have any questions, please contact us toll free at 877-241-0184 or email us at custsvc@pettravelstore.com prior to placing your order. We would suggest that you consider protecting your carrier with a quality pet pad (click here). Our smallest size pet pads fit our pet carriers and provide protection against accidents from nervous pets. Due to State Health Laws, we will not accept the return of any carrier after a pet has been inside the bag – No exceptions. If your pet has not been inside the carrier, it may be returned for exchange as a sale item as long as it returned as received.